This spacious home offers ~1495 sq. ft. plus garage conversion and is situated on a corner parcel offering ~1/3 Acre! The covered front porch opens to stone flooring and handy storage closet. The living room features a cozy fireplace and view of the front yard. The dining area offers a glass slider accessing the back patio. The galley style kitchen boasts abundant cabinetry, tile counters, electric cook-top, oven and dishwasher. The 2 guest bedrooms flank the main bathroom while the master bedroom is located on the opposite side of the house. The master bedroom features two closets and French doors leading to a privately fenced side yard. The indoor laundry room offers access to the backyard as well. The backyard features a storage shed, covered patio and walking path that wraps around to the front porch. 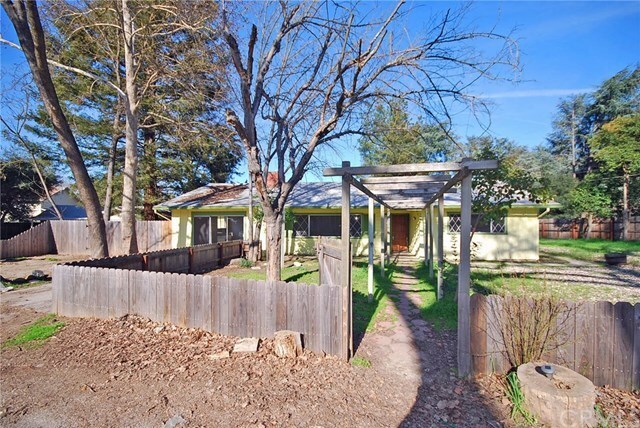 The spacious and fenced yard offers great potential! Hurry, won't last long.